Panjer's recursive method is an efficient method for directly constructing an approximation of the aggregate distribution, where the frequency distribution is any of the following: Poisson, Polya, Negative Binomial, Geometric, Logarithmic, Delaporte. The Max P parameter specifies the upper percentile value of the claim size distribution (called X from now on) at which the algorithm will stop, and the Intervals parameter specifies how many steps will be used in the discretisation of the X distribution. In general the larger one makes Intervals, the more accurate the model will be but at the expense of computation time. The MaxP value should be set high enough to realistically cover the distribution of X but if one sets it too high for a long tailed distribution, there will be an insufficient number of increments in the main body of the distribution. 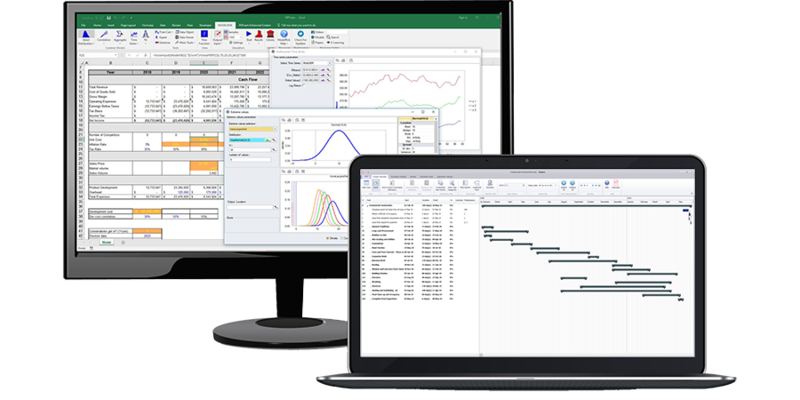 In ModelRisk one can compare the exact moments of the aggregate distribution with those of the Panjer constructed distribution to ensure that the two correspond with sufficient accuracy for the analyst's needs. You can read more about the mathematical details of Panjer's recursive algorithm here. In the Aggregate parameters area, the Frequency and Severity distributions can be chosen: you can insert these manually, link dynamically to a Distribution Object in the spreadsheet, or select a distribution from the Select Distribution window. In the two other fields listed you can specify the Number of Intervals and MaxP parameters for Panjer's algorithm. You can read the details about these in the topic about Panjer's recursive method. Preview graphs for respectively the claim frequency distribution, claim size distribution, and aggregate distribution are shown.